A true taste of the Scottish Highlands was delivered to the heart of Manchester Monday 4 November when Eastern Airways launched its new direct route from Inverness. A fresh salmon winged its way south on the inaugural flight from Inverness for a special meal at the award-winning Le Mont restaurant – Manchester’s first elevated restaurant located at the pinnacle of the city’s Urbis building. 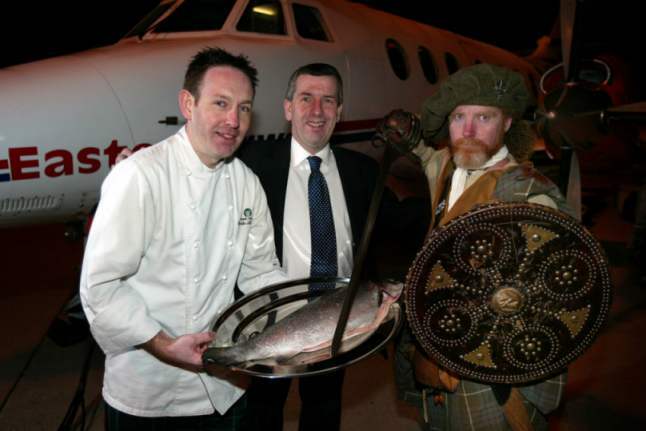 Chef Charles Lockley, from the award-winning Boath House Hotel near Auldearn in Inverness-shire, and his fresh salmon were escorted on the 6.20am flight out of Inverness by ‘Highlander’ Gordon MacIntyre, dressed in the full regalia of a Scottish clansman from a bygone era. On arriving in Manchester, the party was met by representatives of Eastern Airways, including managing director Richard Lake, and Manchester Airport before they travelled to Le Mont in Cathedral Gardens where Charles Lockley prepared a ballantine of salmon for the celebratory lunch. Eastern Airways, the independent regional airline based at Humberside International Airport, will operate three services a day between Manchester and Inverness and has also launched a three times a day service between Dundee and Manchester. Both routes include onward travel opportunities with bmi through a code share agreement. Flights will operate Monday to Friday with BAE Jetstream 32 aircraft. With aircraft over-nighting in both Inverness and Dundee, the early morning departures offer Scottish-based travellers some good onward connections from Manchester. The timings connect, for example, with departures to Copenhagen, Dusseldorf, Frankfurt, and Gothenberg, as well as US cities, Chicago, New York and Washington DC. Travellers from Manchester enjoy direct access to the gateway of the Highlands with onward travel opportunities to some of Scotland’s most stunning and remote locations. Eastern, which operates from Manchester Airport’s Terminal 3, also serves Manchester-Norwich, three times daily, Monday to Friday. The new Inverness and Dundee services complement a growing Scottish network operated by the niche domestic airline. In Scotland, Eastern Airways also operates Edinburgh to Norwich and Humberside and from Aberdeen to East Midlands, Humberside, Norwich, Teesside and Wick. “It has long been our wish to start these services from Inverness and Dundee to Manchester, the UK’s third largest airport. We are also proud to be expanding the number of regional destinations offered by air from the British Isles,” said Richard Lake, managing director of Eastern Airways. Inverness East, Nairn and Lochaber MP, David Stewart, who was on the first flight from Inverness to Manchester and who attended the lunch at Le Mont, said the venture opened up an exciting new set of air connections for travellers and businesses in the Highlands, as well as providing a tourism boost for the north. "It is extremely pleasing to see another development coming to Inverness, bringing visitors from the rest of the UK and from throughout the world," he said. Highlands and Islands Airports operates 10 airports in the North and West of Scotland – Barra, Benbecula, Campbeltown, Inverness, Islay, Kirkwall, Stornoway, Sumburgh, Tiree and Wick. In the year ending 31st March 2002, these airports handled more than 832,000 passengers, 6,755 tonnes of freight and almost 75,000 individual aircraft movements.